When I first started making these cookies my kids were very suspicious; ‘Is there avocado in here? 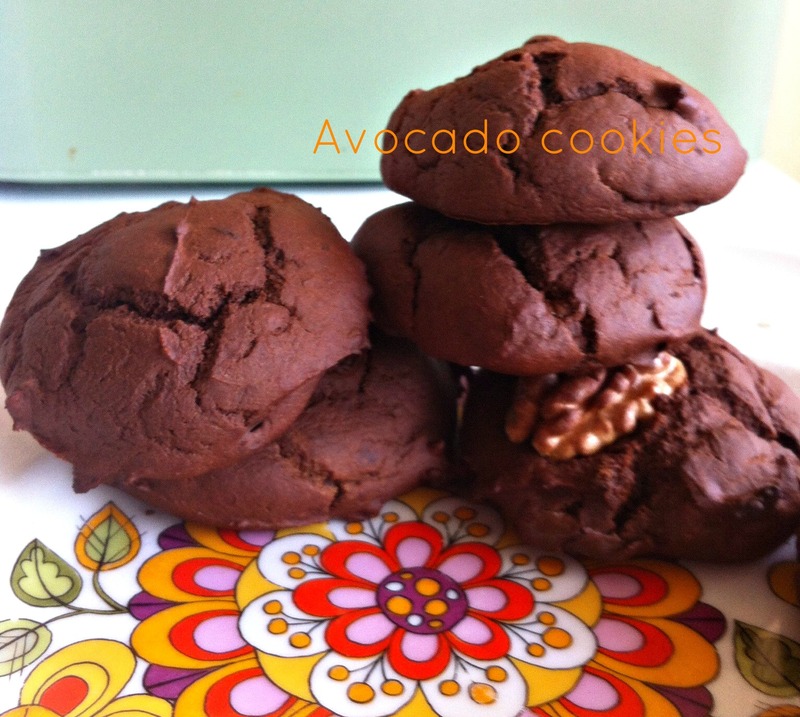 You know we don’t like avocado!’ Turns out they do like these cookies…. Very much, as a matter of fact…. The original recipe I found at two peas and their pod. The first time I followed their recipe step-by-step and ever since I’ve improvised a bit, depending on what I had at hand in my kitchen. Today, I mixed together 1 ripe avocado, 100 ml almond milk, 5 tablespoons of agavesyrup, and 2 tablespoons of sunflower oil in my blender. I love the creamy green result, it looks just magical. 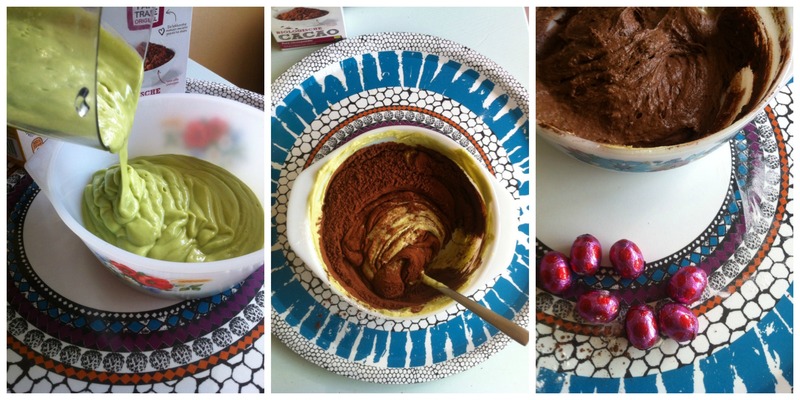 After pouring the green mixture into a bowl ( and then again into another one because I made more than I thought I had) I stirred in 150 gr flour, 16 gr of baking powder, 5 tablespoons of cocoa powder, a pinch of salt and a teaspoon of cinnamon. I also chopped up some leftover Easter eggs (pure chocolate) and stirred them in. On a baking tray I made 20 cookies; a spoonful of batter each, leave a little space in between, and add some nuts on top if you like. Then bake for 20 minutes at 180 degrees Celsius. Let them cool down, then eat and enjoy! Today’s cookies turned out to be not so sweet. For sweeter cookies use more syrup, or add sugar. Just taste the batter and adjust according to taste. There’s little that can go wrong here so just experiment a bit.